This joint famous for its beef noodles, and the previous post on Tong Kee’s egg tarts, certainly earned its stripes. It was fully packed at roughly 12 plus, BEFORE lunch hour, and we had to tumpang an uncle’s table. 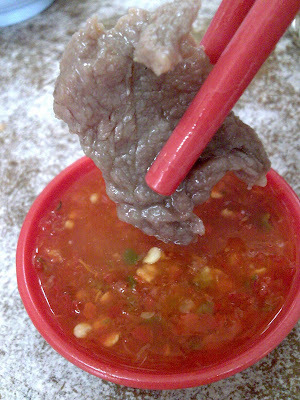 Btw, no prize for guessing what he was relishing, slurping away at his beef noodle soup. (i ordered “lai fun” as I hate yellow alkaline noodles), pickled vege, spring onion, fried shallots, and pieces of beef fillet and beef balls. The meat was nothing extraordinary, but the beef balls were another story altogether! Springy, yet retains the meat texture and taste, it was reli tasty. 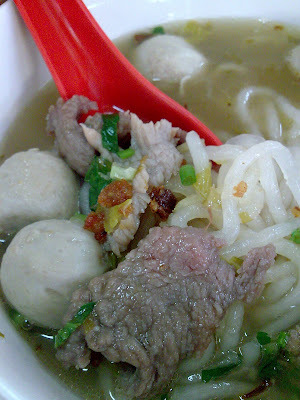 The noodles was more springy and chewy than usual variety, and the soup was reli sweet and brimming with beef flavour. At RM5 a bowl, it was well worth the price. 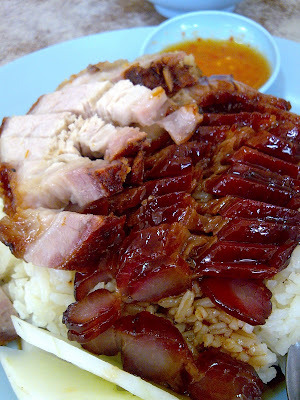 Fren ordered roasted pork & char siew rice (RM5). The portion was generous. I stole a few bites, the roasted pork was nice, though not so crispy, but the char siew was even better. Not overly sweet, not oily/less fat, and more lean meat, just the way I like it. But I’ve a biased preference for char siew, so better not ask me to compare. Haha …. Forgot to try the rice though, but should be OK considering it did not look too soft and lumpy, and quite fragrant. Cool to stumble into your blog, great to see an Ipoh boy on foodblogging, me to from Ipoh! hey thanks! feel free to drop comments, constructive or destructive. can i tag u? wow…the char siew fan looks really delicious!! hey, thanks for dropping by. Yeah, the glistening, caramelized sides of well-BBQ char siew … Yummy! But there are a lot better ones, in Ipoh though. =P will get to them in the future … I am an avid fan of char siew!